Be sure that the heat sinks are well adhered at 4 small PCBs (Motor Drivers), respectively. Be sure that all of the wires are well connected before assembly and use. Be sure that the lengths of 6 lower arms are the same. If there is one that is relatively long, it is because the magnetic holder and carbon pipe are not bonded properly each other. In this case, please let us know before using the product. The main wire (which connects between main board and end-effector) is delivered with the wheel wound. Please separate the wire from the wheels before assembling the product. Although we have mentioned in manual that we recommend to use the textured surface for bed, you can also use the opposite side. The opposite side is better adhesive, and more difficult to remove the printout, than the textured side. If you would like to keep using the textured side, please print the attached g-code 2~3 times before use. The adhesion of the textured side gets better as you print. You can pull out the Teflon tube, with pressing down the black ring-type button. Because it is designed so that it does not fall out well, a little trick is needed. Be sure that the cooling fan (fan placed vertically) is facing the front, when installing the end-effector. 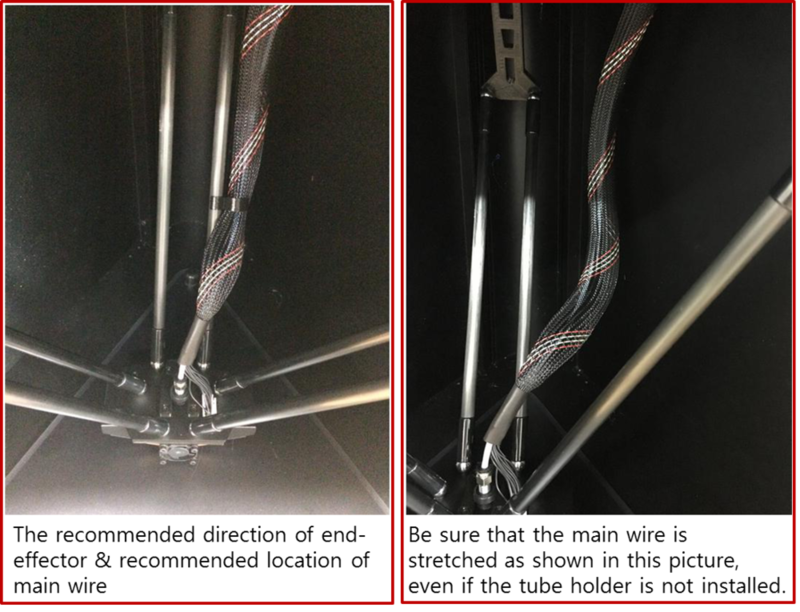 The main wire and Teflon tube should be stretched to the right back direction. After confirming this, install the tube holder to the lower arm which is placed right back side. When printing, be sure to insert the tube holder as shown in the attached picture. Please refer to the attached picture below for the connection of the lower arms, the direction of the end-effector, the position of the main wire, and the position of the tube holder, for upper item 7 & 8. -The distance between nozzle and bed might be too far. Please adjust the gap again (See page 21 of manual, 'Calibration' part.). -First, check if the filament on spool is twisted. If it is, please untangle the spool and try again. -Heat up the nozzle and try to force the filament by hand, while pressing the red spring presser on the extruder. -If still clogged, pull the filament out of the extruder with the hand, then cut off the bulged end of the filament and reinsert it. -If the problem persists, please use the enclosed nozzle cleaning needle to drill directly. - Usually it is caused by bad connection. Turn off the power first. Then please check the connectors at both of PCB and LCD sides, and try to press down the connectors to insert fully. If it still shows white only, please contact us via support@locoop.net .